Happy National Coffee Day! Along with supporting CMN Hospitals with balloon sales and grassroots fundraising events during the month of September, Love’s is also running a National Coffee Day fundraising event this Friday, September 29. Loves will sale every 24 oz. 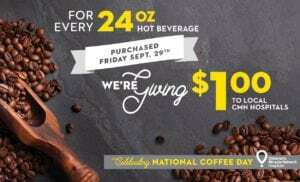 HOT BEVERAGE for $1 on Friday, September 29, and will donate that $1 to their local CMN Hospitals. So stop by your local Love’s Travel Stop and enjoy a delicious cup of coffee! Previous post: Aflac Goes Gold! Next post: It’s Time to Tee Off Fore Kids!